It must be spring, the Forsythia has coloured up. Noticeable colour in the buds clothing the bare stems is the first sign that we are pulling out of winter and day length is increasing. 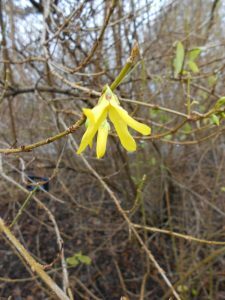 Forsythia x intermedia ‘Spring Glory’ is the first to break ranks in the two beds planted with species and cultivars of the genus Forsythia. A plant as reliable in its flowering as spring follows winter. 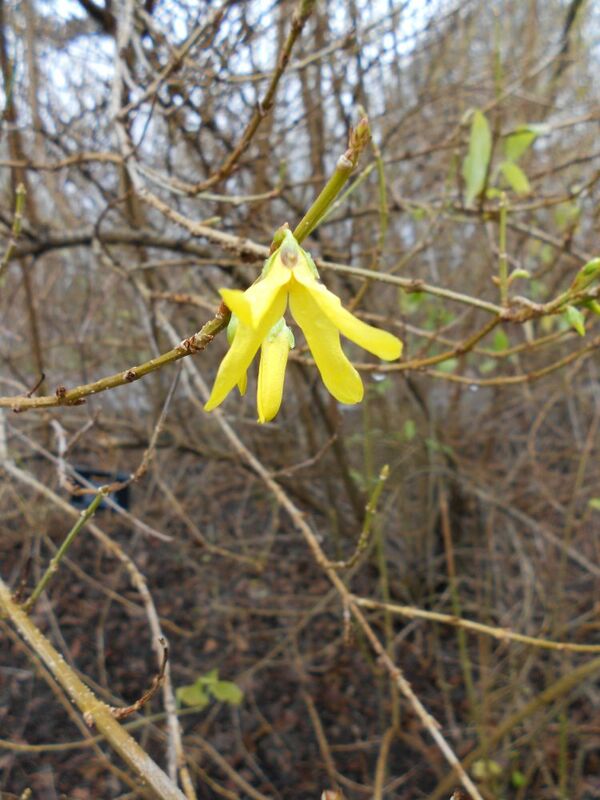 The buds respond to the increasing warmth and open exposing the bright yellow petals. Expanding to splay out and recurve slightly. One of the many cultivars resulting from the hybridisation of F. suspensa and F. viridissima. ‘Spring Glory’ is a further hybrid from an earlier American cultivar ‘Primulina’. All to the benefit of gardeners who by planting add to the colour of spring. Secondary to this, although a sighting of equal importance confirming that spring has indeed arrived was the sight of not one but three of the finance department staff on a lunch time perambulation through the Garden on a day when the maximum temperature reached 11c at midday. This on the 25th February when the sun shone from 8.30am continually until 3.45pm and then again made a spot appearance at 4.15pm.